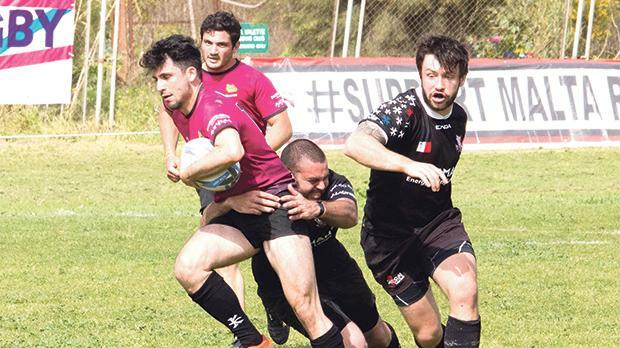 A Kavallieri team, in a rebuilding phase after the loss of so many players over the last two seasons, were no match for a dominant Stompers team who carried on with their running style of rugby following the previous week’s fine showing against Overseas in the league. With Richard Gum at flyhalf controlling the game and a forward pack that shoved Kavallieri off the ball at every scrum, it was front foot play that, at times, had Kavallieri chasing shadows. In the first half Stompers kept the pressure on Kavallieri, pinning them inside their own territory for most of the time, scoring consistently with Nathan Gatt, Gum, Nicky Maylor, Jeremy Debattista and Mathew Alexander all scoring tries. Gum kicked four conversions and at half-time the score stood 33-5 for the Stompers. Kavallieri had scored just before the interval through Jean Pierre Zammit. He crashed over at close range after his team had kept Stompers under pressure with a rolling maul from a lineout. As the second half got underway, Stompers surged into attack, scoring within a few minutes through Josef Azzopardi. He charged down a Brendan Dalton clearance and running it in under the posts from 30 metres out. Gatt scored his second try and another from Debattista, running straight from a Gum inside ball, with the conversions, the score now soared to 55-5. Kavallieri were struggling to get any continuity in their game. There were some good individual plays but it seemed they were not all on the same page regarding the game plan. They needed to play the phases and build but instead lone runners were being isolated and the ball ripped off them. However, they battled on and kept their heads up. Gary Hili intercepted a Kavallieri pass and for a prop showed some good pace as he steamed downfield 50 metres. He was caught by Dalton but the ball was offloaded to Formosa who scored. Chris Betts, who had moved into flyhalf, used his pace and swerve to score a fine try and Max Galea grubbered a kick through for Gum to run onto and he scored out wide to round up the score to 78-5. Meanwhile, in last weekend’s other Cisk League match Overseas beat Falcons 31-20, keeping their hopes alive for a play-off against Stompers. Richard Gum (Stompers); Jean Pierre Zammit (Kavallieri).